Former Starbucks CEO Howard Schultz’s dalliance with a 2020 presidential run as an independent has sparked outrage among many in the Democratic Party who are worried he’d divert votes away from their nominee and help President Trump get re-elected. Last Sunday, Schultz told “60 Minutes” that over 40 percent of the electorate is either registered as an independent or says they identify as an independent. And while that may be technically true — Gallup shows that roughly 39 percent of Americans say they’re independents — it also signals a fundamental misunderstanding of how the electorate really feels. And that’s because once you subtract independents who lean more toward one party, the number of true independents shrinks to around 10 percent. Using this metric, Gallup finds that roughly 88 percent of Americans identify with one of the two major parties, and Pew Research puts that figure even higher, at 92 percent. This is important because independent leaners vote for their party at rates similar to those who identify as Republican or Democrat. For example, if we include independent leaners with the party they preferred, 92 percent of Democrats and Republicans backed their respective party nominees in the 2016 presidential election. And despite the 2016 election featuring the two most unpopular major-party nominees in modern times, only 6 percent of voters decided to cast ballots for third-party candidates. 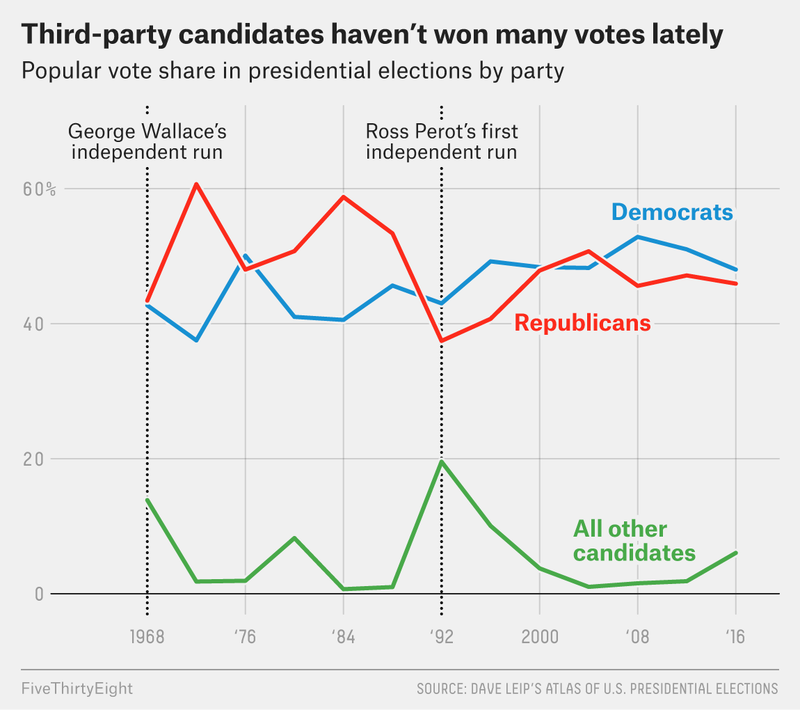 In fact, the last time third-party candidates accounted for more than 10 percent of the vote was more than 20 years ago, in the 1996 election. But even if a third-party candidate could win over true independents and even some Republicans or Democrats, like Ross Perot did in 1992, it would be extremely difficult to garner enough votes to win — and that’s because of the Electoral College. Take the case of Perot. He won 19 percent of the vote in 1992, which is the largest national popular vote share for a third-party candidate since 1912, but he didn’t win a single electoral vote. In his best state, Maine, Perot lost by 8 points to Bill Clinton. Perot’s underperformance highlights the systemic challenge third-party candidates face in the Electoral College. All but two states give all their electoral votes to the candidate who won the majority or plurality (however slim) of votes in the state,1 so for a third-party candidate to win electoral votes, he or she must win states outright, which Perot wasn’t able to do in 1992. Some candidates with a stronger regional base, like segregationist George Wallace, have had success winning a handful of electoral votes, but otherwise a third-party candidate hasn’t been able to overcome the major-party duopoly. What we’re seeing play out is a concept known in political science as Duverger’s Law, or the idea that in two-party political systems, voters are loath to “waste” their votes on a third-party candidate unlikely to win.2 And while this “law” doesn’t entirely hold up in other countries, it remains very true in the U.S.
It’s been more than 50 years since a third-party candidate carried a state in a presidential election. The last third-party candidate to pull off this feat was Wallace, in 1968. He won 13.5 percent of the national vote, five southern states and 46 electoral votes.3 Although this was a strong performance for a third-party candidate, Wallace didn’t come close to winning. He captured just 9 percent of all electoral votes, well short of a majority. But Wallace didn’t expect to win: His real hope was to deny either Richard Nixon or Hubert Humphrey a majority in the Electoral College, and then use his influence to gain concessions on civil-rights issues. Wallace’s plan didn’t work, but it does speak to some of the ways third-party candidates have tried to use their bids previously. So if a third-party candidate is unlikely to win, why do they still run? Historically, there are a variety of reasons why candidates have thrown their hats into the ring, but relatively successful third-party candidates have depended on fractious party schisms, frustrations with the status quo, regionally based movements, and poor economic conditions. The question is, do such conditions exist right now, and could they be enough to make someone like Schultz competitive? A classic example of a party schism prompting a third-party run is former president Theodore Roosevelt’s campaign in the 1912 election.4 After losing an ugly Republican nomination contest to conservative-backed President William H. Taft, Roosevelt ran under the Progressive or “Bull Moose” Party banner as a reform-minded progressive. Republicans split between Roosevelt and Taft, allowing Democrat Woodrow Wilson to easily win the presidency with just 42 percent of the popular vote. But could a serious schism on par with 1912 happen in 2020? There’s a possibility that Democrats will be divided after an ugly battle for their party’s nomination, but remember that voters are ideologically sorted now in a way that wasn’t true in the past. That probably makes a major cleavage unlikely. Later, in the 1924 election, Republican Robert La Follete tried to make a go of it as a third-party candidate frustrated with politics at the time. With the major parties each nominating conservative candidates, La Follette attracted support of farmers and laborers who felt the two major parties were ignoring their interests. As the lone progressive-minded candidate in the race, La Follette won 17 percent but only carried his home state of Wisconsin, while Republican President Calvin Coolidge comfortably won the election with 54 percent of the popular vote. But given how polarized the electorate is now, it’s unclear if there’s an appetite for a “centrist” bid that tries to appeal to members of both parties. Issue-based regional movements have also sparked third-party bids. The Populist Party, led by James Weaver in 1892, was largely an agrarian movement arguing for, among other things, a looser monetary policy known as free silver. Weaver won 22 electoral votes, performing best in the western half of the country where the free silver policy had major appeal. Strom Thurmond ran as a segregationist in 1948 to push back against the inclusion of a civil rights plank in the Democratic Party’s platform, and Wallace followed suit in 1968, but in both cases, support was mostly limited to some southern states. Today’s politics are more nationalized than ever, so it’s hard to see a predominantly regional candidacy popping up now. And third parties that are focused principally on narrower national issues, such as the Green Party, have not made much headway, winning at best around 3 percent of the national popular vote. Dissatisfaction with economic conditions and the major-party candidate choices can matter, too. Liberal Republican John Anderson’s independent bid in 1980 garnered almost 7 percent of the vote because of doubts about Jimmy Carter’s leadership abilities and questions about Ronald Reagan’s competency. (A terrible economy also played a part that year.) But a poor economy isn’t enough to put a third party in office on its own. In 1992, Perot voters were frustrated by the status quo in Washington and the economic environment, but even with the resources of a billionaire, Perot was still unable to win more than 20 percent of the national vote. Economic confidence has been relatively high in recent months, so Schultz may not have much opportunity to build a base on that issue, which is a problem for a candidate who is using reducing the national debt as a platform. In the end, if Schultz decides to run, he could spend millions on a third-party bid and still be highly unlikely to win. Yet, like some third-party candidates before him, he could prove to be a major factor if he woos more voters from one side than the other. Electorally speaking, that is where his real importance would lie. Maine and Nebraska decide some of their Electoral College votes by congressional district. More specifically, political systems with single-member districts and winner-take-all elections push voters toward a two-party system. Wallace won 45 electoral votes from those five states, plus one “faithless elector” from North Carolina. Roosevelt had previously served as president from 1901 to 1909, but didn’t run for re-election in 1908.